Preheat oven to 375°F. Spray 48 miniature muffin cups with baking spray; wipe away excess from top of pans. Stir together oil, sugars, Egg Beaters, water and vanilla in large bowl. Add flour, salt, baking powder and baking soda; stir just until blended. Stir in oats and candy-coated pieces. Drop dough, by heaping tablespoons, into each muffin cup. Bake 10 minutes or until golden brown. Cool slightly in pan. Remove from pans and cool completely on wire racks. Decorate cookies with candy flowers as desired. Cookie dough also may be baked as regular drop cookies on lightly greased baking sheets. Bake as directed. Semisweet chocolate morsels may be substituted for the mini candy-coated chocolate pieces. To make MARSHMALLOW AND CANDY FLOWERS: Cut large marshmallows in half; press candy-coated chocolate pieces or small jelly beans on sticky side of marshmallow in a flower pattern. Insert thin pretzel stick for stem; place in 'Flower Pot' Cookie. Mini marshmallows also may be cut in half and pressed in colored decorating sugar. Arrange pieces in flower design on top of cookie and hold in place with a little frosting. To make GUMDROP FLOWERS: Press small gumdrops flat with metal spoon. Dip spoon in sugar if it becomes sticky. To make 'tulips', cut 2 little triangles out of top. To make round flowers, attach a chocolate morsel with frosting in the center. 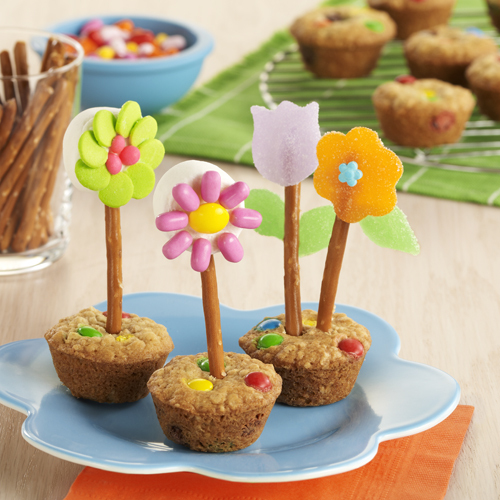 Carefully insert thin pretzel stick for stem; place in 'Flower Pot' Cookie. A small green gumdrop may be flattened, cut in half and attached to pretzel for leaves.